There was some healthy discussion on my recent article about pianist Angela Hewitt's Bach World Tour T-shirts. No discussion on my Future Radio programme this Sunday (Jan 27) at 5.00pm UK time, just 51 minutes 3 seconds of the perfect pianism of Angela Hewitt playing Messiaen and J.S. Bach, connected by less than 5 minutes of the usual low key links from me. The audio stream can be launched here, and is available in real time only. There is some interesting music coming up on my Future Radio webcasts in the next few months. It includes Elliott Carter's Sonata for Flute, Oboe, Cello and Harpsichord, Michael Tippett's Second Symphony (why aren't his symphonies performed more often? ), and a new recording of Lou Harrison's Concerto for Violin and Percussion Orchestra, all complete - no extracts. Through the year I will also be playing all the Vaughan Williams symphonies. Future Radio agreed to this following very positive listener responses to my broadcast of the Fifth earlier this month, and they are rearranging their schedule to accomodate the 71 minute Sea Symphony in August to coincide with the centenary of the composer's birth. On April 6 I will be presenting Karajan and Twentieth Century Music to mark the centenary of the conductor's birth. For all his faults Karajan made some superlative records, none more so than his 1972 recording of Arthur Honegger's Third Symphony Liturgique, and I'll be playing that with his 1973 recording of Alban Berg's Three Pieces from the Lyric Suite, both with the Berlin Philharmonic. Framing all these contemporary works will be music by Bach, Tallis, Corelli and from the Sephardic Diaspora. It's all about thinking outside the box, as Olivier Messiaen did. Well, I'm certainly going to try to catch this broadcast, although noon my time (Eastern) is not usually convenient. I've not yet been able to warm to Hewitt's playing (most of what I've heard has been Bach). It's beautifully done, elegant, clear ... but it just hasn't drawn me in yet. For contrast, two widely ... or wildly ... different artists who do capture my attention in Bach are Leonhardt and Gould. 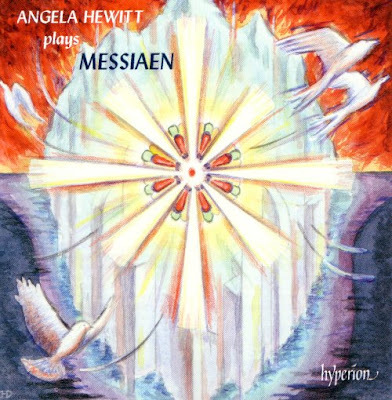 And I've never heard Hewitt play Messiaen. I'm looking forward to the program.